WARPED, twisted and riddled with fractures, Senja’s mountains conceal a million expressive faces. 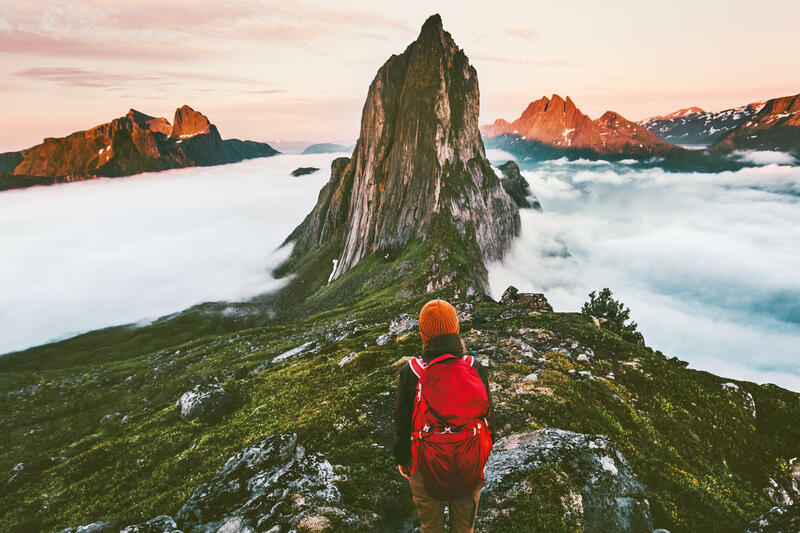 But of all the peaks tearing from northern Norway’s coastline, one summit stands out in particular; gazing towards the tempestuous Norwegian Sea, a pendulous nose sagging below matted hair, it’s even been recorded in the book of Guinness World Records. When Leif Rubach started building Finnsaeter’s Senjatrollet in 1993, he had no idea his childhood fantasy would grow into one of the island’s most curious tourist attractions. 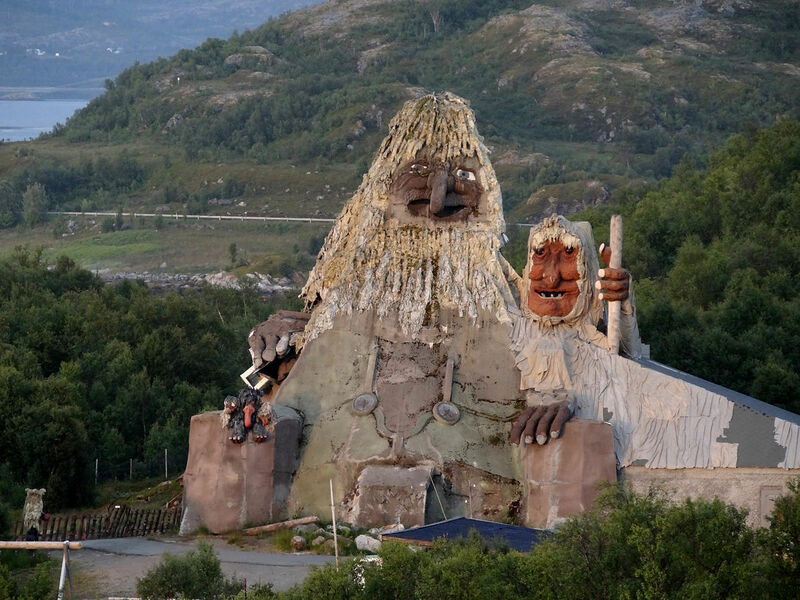 Celebrating its 25th anniversary this year, the world’s largest man-made troll towers 60ft high. A source of fascination throughout Scandinavia, trolls could find no better home than Senja, an island sitting above the Arctic Circle that is connected by a bridge to the mainland. Often described as Norway in miniature, it has all the natural attractions drawing people to the country – creating plenty of places for fairytale characters to thrive. “Trolls are everywhere,” says Leif, now in his 70s, who is up a ladder making final adjustments to his latest family addition, “the sextuplets” – six teenage trolls. Growing up in the small fishing village of Gryllefjord, Leif first encountered the gnarly creatures on boat trips with his uncle, and in the absence of electricity, dark evenings were spent listening to legends and fantastical tales told by candlelight. Leif’s wife Siw writes books and works in the souvenir shop, selling CDs from Leif’s band, The Trolling Stones, who perform here daily during summer. “Just the other day, someone told me they’d seen Hulder,” Siw whispers conspiratorially, referring to the supernatural siren from Norwegian folklore. She says it without a hint of irony. A short distance from Finnsaeter, Hamn I Senja hotel overlooks the Bergsoyan archipelago, a cluster of coral mounds looped by turquoise waters and a favourite resting point for seals and sea eagles. From the top of Sukkertoppen mountain, I have a clear view of the landscape – a gnarled, outstretched hand reaching into the sea, with fjords running gently through its fingers. Energised, I drive for half an hour to Steinfjord, through tunnels hewn into rocks seemingly crawling with trolls. At Tungeneset, a wooden walkway leads to the water and a perfect viewing platform for the Devil’s Teeth, a series of serrated rocks biting at the sky – one of the most photographed spots in Norway. Gulls surf on fierce waves thrashing at the rocks and, in the dead of night, it’s just me and the ocean. While Senja’s dramatic scenery is concentrated in the north, the south of the island is equally alluring – and much more sheltered. Upturned boats rest off the shores of motionless lakes displaying perfect mountain reflections, in a place where shops and service stations are few and far between. Former city-dweller Hege Dekkerhus spent five years falling in love with Senja, eventually buying Camp Tranoybotn on the edge of Anderdalen National Park a year ago. Beyond the caravans and cabins, a white tower for two sits on the water’s edge, it’s 360-degree windows filled with views of mountains and sea. Inside, the theme is nautical –fishing net curtains, decorative glass teardrop buoys and hanging rails made from wooden oars. The number of islands in this fjord makes it perfect for kayaking, and Hege describes her daily paddles as a form of meditation. We make a trip to Tranoya, an island which has been inhabited for nearly 2,000 years and has remains of a Viking boathouse. Sitting alongside grass-roofed cottages, a wooden church from 775 contains an original altar and pulpit – remarkably colourful for their time. At Camp Tranoybotn, Hege tells me she hopes to start storytelling sessions. With so much history to draw on, she’ll have no shortage of material. And, in a place like Senja, imaginations can run wild. After a few days, even trolls don’t seem so far-fetched.